Velocity Selectors - National Electrostatics Corp. The NEC Crossed Field Velocity Selectors provide mass and charge analysis. For a fixed energy, the velocities of the different mass components are different, and only the selected mass passes undeflected. With a beam of several charge states accelerated through a fixed potential, the velocity selector may be used to select a certain charge state. Various models are available for use in high potential terminals and for analysis of exterior ion source beams. 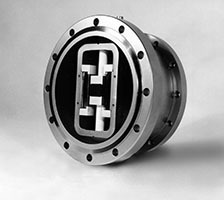 The electrical field is applied between two parallel plates, each of which is supported by insulating pillars that are mounted on opposite sides of the support tube and secured to the vacuum housing end flange. Voltage to the plates is applied through two high voltage shielded feedthroughs. Two ceramic permanent magnets provide a uniform magnetic field at the center. The magnets are clamped to the support tube made of heavy wall rectangular steel plates and their faces are protected from sputtering by thin stainless steel sheets. The selector is provided with field terminal plates at both ends and the selection aperture is mounted on the support frame. There are four available options. Below are brief descriptions.